Thomas Edison said, "To invent, you need a good imagination and a pile of junk." His reference was to inventing, but he could have also been speaking about prototyping. 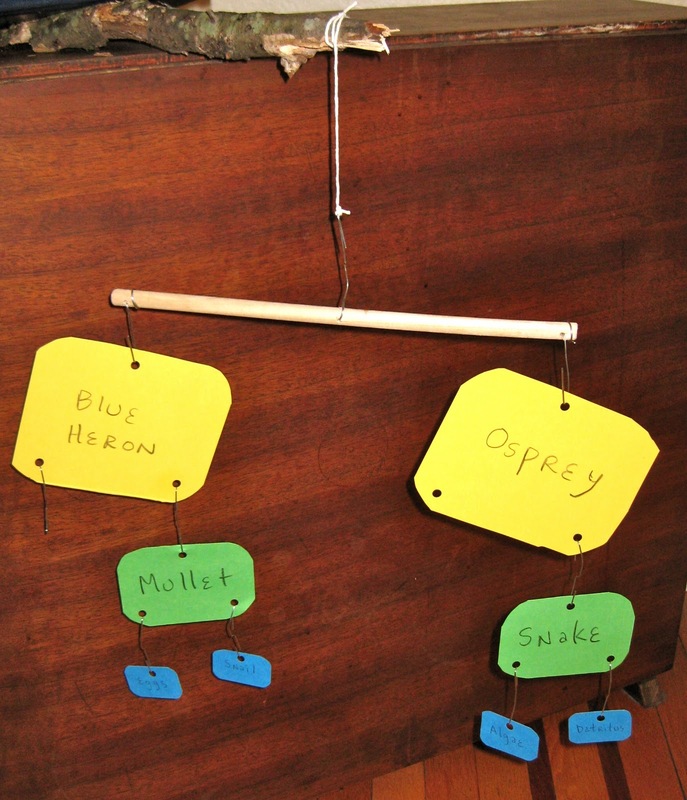 To me, prototyping is an iterative process that uses simple materials to help you answer questions about the physical aspects of your exhibit components (even labels!) early on in the development process. Maybe it's just me, but I can't imagine anyone fabricating an exhibit component without trying out a quick-and-dirty version first. 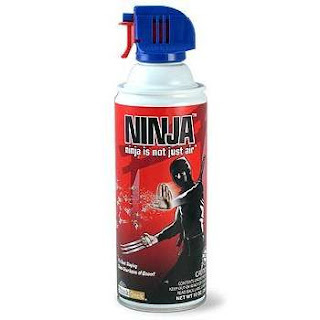 So in today's post I thought I'd lay out the simple steps I use to show how quickly and inexpensively prototyping can be integrated into the beginning of any exhibit development process, and how you too can become an Office Supply Ninja! STEP ONE: Figure out what you want to find out. In this case, a client wanted me to come up with an interactive version of a "Food Web" (the complex interrelationship of organisms in a particular environment, showing, basically, what eats what.) We brainstormed a number of approaches (magnet board, touch screen computer) but finally settled on the notion of allowing visitors to construct a "Food Web Mobile" with the elements being the various organisms found (in this particular case) in a mangrove swamp. The client was also able to provide me with a flow chart showing the relationships between organisms and a floor plan of the area where the final exhibit will be installed. 1) Did people "get" the idea conceptually? That is, did they understand the relationships and analogies between the Food Web Mobile and the actual organisms in the swamp? 2) Could they easily create different sorts of physical arrangements with the mobile that were interesting and accurate? STEP TWO: Get out your junk! Before I even start assembling a complete rough mechanism or system I like to gather all the parts together and see if I like how they work with each other. 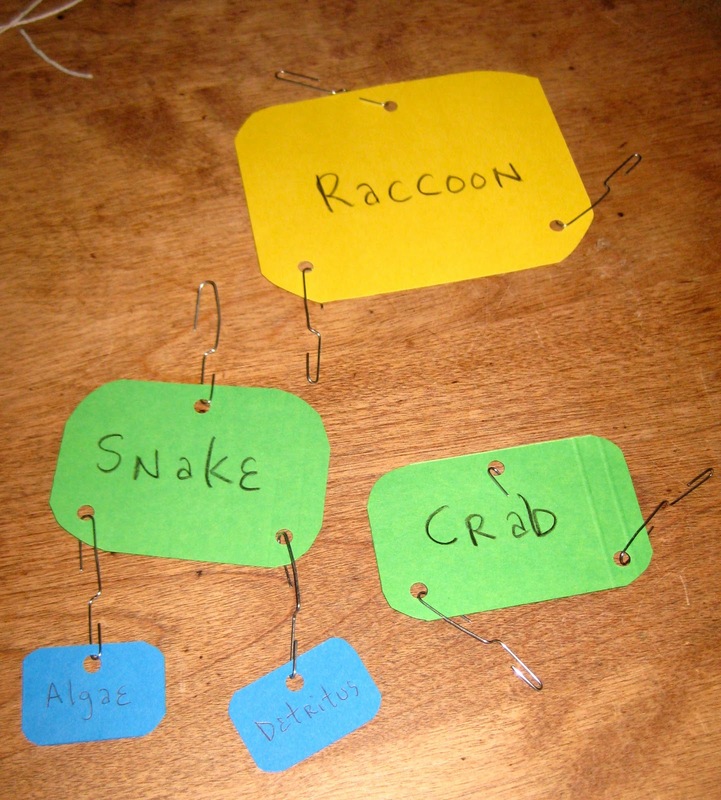 In the case of the Food Web Mobile prototype, I used colored file folders to represent different levels of organisms. I initially made each color/level out of the same size pieces, but then I changed to having each color be a different size. Finally, I used a hole punch to make the holes, and bent paper clips to serves as the hooks that would allow users to connect the pieces/organisms in different ways. STEP FOUR: Assemble, then iterate, iterate, iterate! This is the part of the prototyping process that requires other people beside yourself. Let your kids, your co-workers, your significant other, whoever (as long as it's somebody beside yourself) try out your idea. Obviously the closer your "testers" are to the expected demographic inside the museum, the better --- ideally I like to prototype somewhere inside the museum itself. Resist the urge to explain or over-explain your prototype. Just watch what people do (or don't do!) with the exhibit component(s). Take lots of notes/pictures/video. Then take a break to change your prototype based on what you've observed and heard, and try it out again. That's called iteration. In this case, I saw right away that the mobile spun and balanced in interesting ways, but that meant that the labels would need to be printed on both sides of the pieces. 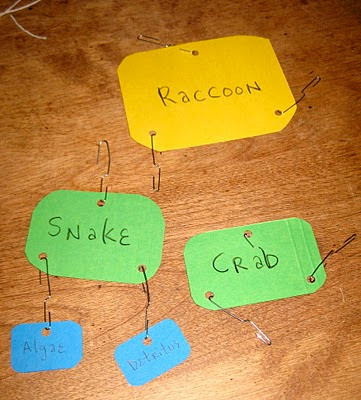 Fortunately, my three "in-house testers" (ages 6, 11, and 13) seemed to "get" the concept of "Food Webs" embedded into the Mobile interactive, and started coming up with interesting physical variations on their own. STEP FIVE: Figure out what's next ... even if it's the trash can! Do you need to change the label, or some physical arrangement of your prototype? Using simple, inexpensive materials makes that easy. Do you just need to junk this prototype idea? Using simple, inexpensive materials makes it easier to move on to a new idea, too. (Much more easily than if you had spent weeks crafting and assembling something out of expensive materials from your workshop...) It's not too surprising to see people really struggle to let a bad exhibit idea go, especially if they've spent several weeks putting it together. Quick and cheap should be your watchwords early on in the prototyping process. In this case, I sent photos of the paper clip prototype and a short video showing people using the Food Web Mobile to the client as a "proof of concept." They were quite pleased, and so now I will make a second-level prototype using materials more like those I expect to use in the "final" exhibit (which I'll update in a future post.) Even so, I will still repeat the steps above of gathering materials, assembling pieces, and iterating through different versions with visitors. I hope you'll give this "office supply ninja" version of exhibit prototyping a try for your next project! If you do, send me an email and I'd be happy to show off the results of ExhibiTricks readers prototyping efforts.